The Tuscany Riding Center is a wonderful way to explore the heart of Italy on a motorcycle ! Tuscany is one of most famous regions in Italy and with Florence, Siena and Pisa. Its enchanting landscapes have inspired many artists over the ages and today it is one of the most enjoyable areas for motorcycle enthusiasts. From the Appennini Mountains to the Tyrrhenian coast, the natural landscapes are truly enchanting. Tuscany and Umbria have dozens of little walled villages and fortresses from the Middle Ages. Places where you can explore the historical buildings, cobblestone streets, tiny churches and severe watchtowers overlooking the valleys. You will never forget walking through ancient cities like Florence, Siena and Pisa and small enchanting villages like San Gimignano, Todi, Spello, Arezzo, Assisi, Volterra and Monteriggioni. A trip to Tuscany would not be complete without sampling the local wine and cuisine. A typical dinner at our hotel or a simple lunch in a local family run Trattoria restaurant will each offer a unique dining experience. Be sure to enjoy the world famous Chianti wine and discover the many other delicious wines of the region. The Tuscany Riding Center allows you to discover all that the region has to offer with the comfort of having a base from which to travel at a hotel overlooking the ocean. You are welcome to join the many different rides that our English-speaking tour guide will propose and lead each day. 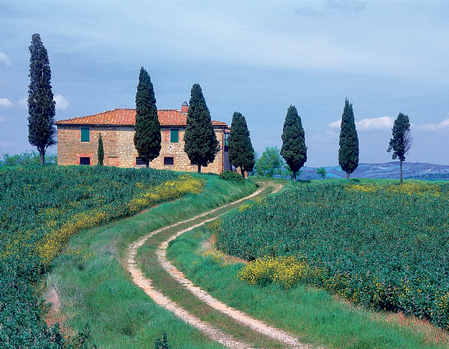 You can also choose to ride and explore Tuscany on your own. We will pick you up at the airport in Florence and take you to the hotel where a motorcycle is waiting for you! Morning meeting in Florence, bike papers and briefing with your guide, then ride to San Gimignano for lunch. In the afternoon, we will ride to the hotel in Castiglioncello, on the Mediterranean coast where we will have a welcome briefing, followed by dinner and overnight. 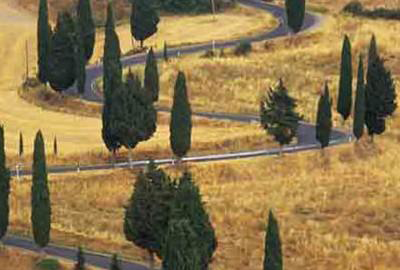 You will enjoy the fantastic guided rides through the central Italian region of Tuscany. Volterra, San Gimignano, Monteriggioni, Siena will become familiar names after this week. Ride at your own pace on the sweeping hillside roads. Taste the wine, enjoy the food specialties and come back every night to the hotel for a sunset swim in the outdoor pool overlooking the sea and an “aperitivo” glass of Chianti. Easy day to ride back to Florence, may be stopping in Volterra for a last visit, drop off the bikes and spend the last night in Florence. Dinner tonight will not be included. 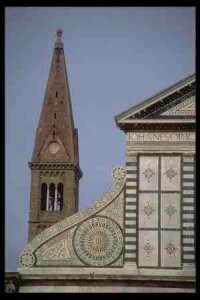 Leisure time until the arrival of your self-organized transfer to the airport in Florence for your flight back home. 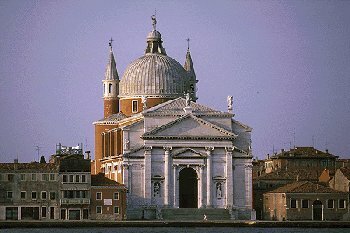 That is, unless you decide to stay longer to explore this wonderful part of Italy! 7 nights in a 4* hotel in Castiglioncello with dinner and breakfast. 1 night in a 3* hotel in Florence with breakfast. Italian guide on his motorcycle. Luggage transfer from Florence to Castiglioncello and back.